In 2019, I will run occasional features, showcasing the great work of Extension beyond Family Development. All of us in Extension are committed to Minnesota, the partnerships we have, and the families we are honored to serve. This article appeared originally in Extension Highlights. 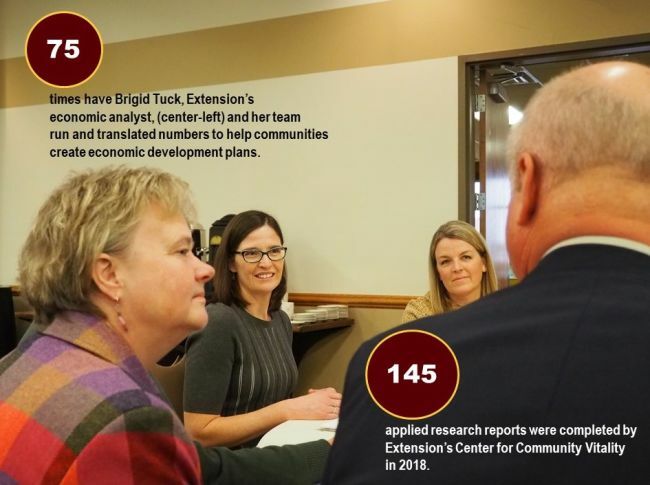 As University of Minnesota Extension’s economic analyst, Brigid Tuck knows that decision-makers have a daunting amount of data available, so she guides them to ask the right questions, and her reports and presentations provide a thorough interpretation. Read Tucking in the numbers for Greater Minnesota on Extension Highlights. This Highlight also features Tuck's Getting to Know Greater Minnesota's economic 2019 update, and includes an example of economic diversity—the sport of curling— from Minnesota's northeast region.